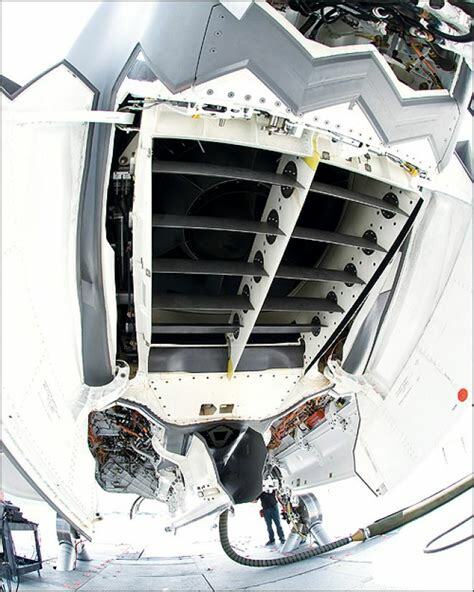 As the engine nozzle rotates, the lift-fan cannot. Wouldn't this imbalance of moments around the center of gravity result in the F-35 pitching up onto its back? 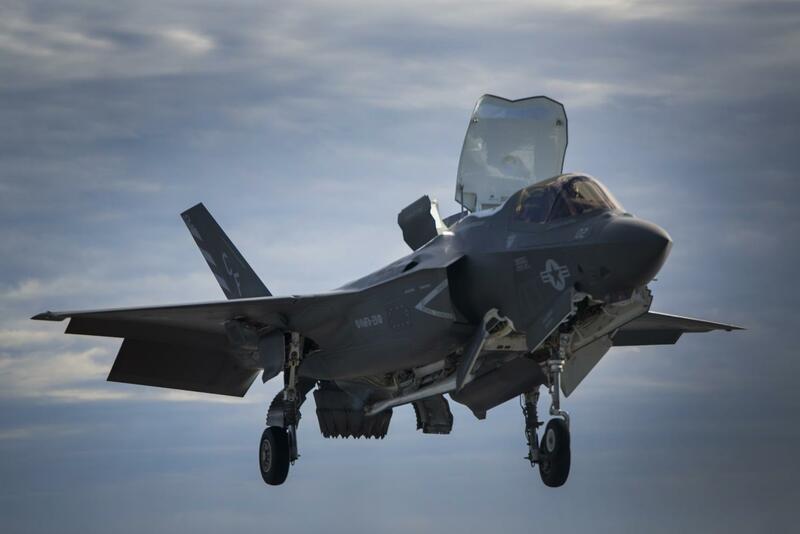 the F-35B is capable of transitioning from vertical hover to horizontal flight. It accomplishes this in part by gradually rotating the engine nozzle from the vertical position to the horizontal. $\theta$ being the angle between the jet exhaust and the vertical axis. The problem is, the lift fan does not rotate. And since it is attached by shaft to the engine, we assume it always rotates at the same RPM as the engine itself. Therefore, the vertical component of lift of the lift fan does not change for a given throttle input, while the vertical component of the jet engine nozzle does! So as the nozzle transition occurs, the thrust of the lift fan (ahead of the center of gravity) stays constant, but the vertical thrust behind the center of gravity (rear engine nozzle) reduces: shouldn’t this cause the aircraft to pitch upwards and flip onto its back? Yet in the video the aircraft seems to pitch up only ten or so degrees (I assume due to the increased coefficient of lift on the wings) but otherwise stays flat in pitch. The thrust of the lift fan must be somehow modulated to accomplish this, right? If so how is this done if its shaft speed is tied to that of the engine? 1. As the aircraft’s forward velocity increases, the lift of the wings compensates for the reduced vertical lift of the rear engine nozzle. 2. The aircraft pitches up so as to deflect the angle of the lift fan from the vertical to match the angle between the engine nozzle and vertical. To try and change lift by changing fan blade speed would be too slow to modify the lift for "tiny" and "delicate" changes in how the plane hovers. Like a helicopter, the F-35 is able to maneuver in very small movements and change very fast (in fact likely better than a helicopter). So the pilot can "nod" to you, and move around the front nose with tiny, delicate moves. So tiny movements by the F-35 and the flight stick are rapidly accepted by the flight computers. Now a helicopter uses variable pitch blades to make rapid changes, which allows helicopters to achieve tiny, delicate, and fast "little" moves. So tiny fast changes in lift are required for these delicate moves. 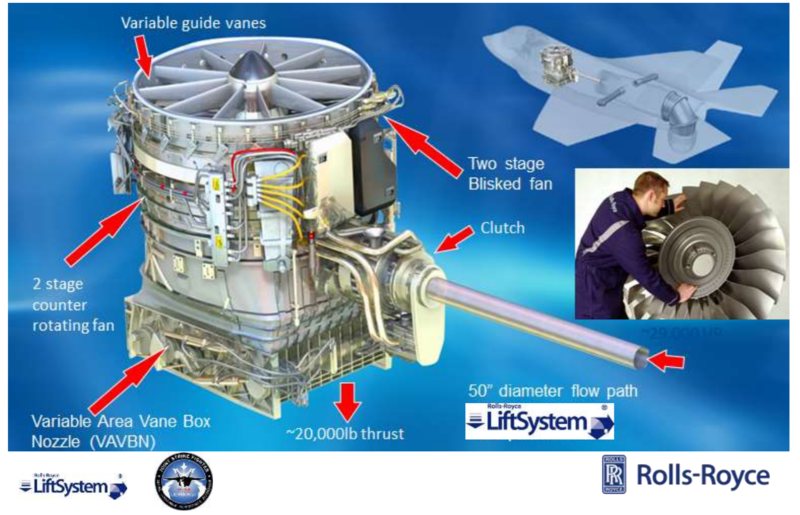 Change of engine throttle to change fan lift would be far too slow (for the F-35, or for a helicopter). To save weight, and complexity, the F-35 lift fans are counter rotating, and they are light weight carbon fiber. So, to rapid change lift and have rapid tiny changes in lift, they simply change the area/size of the exit exhaust area of the lift fan. Think of those "variable" nozzles much like a window shutter to let more or less light into a room. So, you can open a bit more, or close a bit more. However, when you close the shutter more, then where does the air go? It has to go somewhere! (remember, up to 20,000 lbs is created by that fan). Well, there is a second set of doors that open right behind the one large fan lid. Those 2nd set of doors behind the big lift fan lid are to allow venting of the lift fan. So you need a fast and delicate means to change lift fan output. So amazing and so tiny are these changes, that the pilot can "nod" the nose down a bit. Very tiny changes are achieved. So to change the fan downforce you thus close or open the lift fan exit (exhaust) area doors. This can be closed or opened rather fast, and also by tiny amounts. This gives delicate control. However, when you squeeze close this exit area, then the lift fan air has to go some place else, so it is vented out those doors right behind the big lift fan lid door. 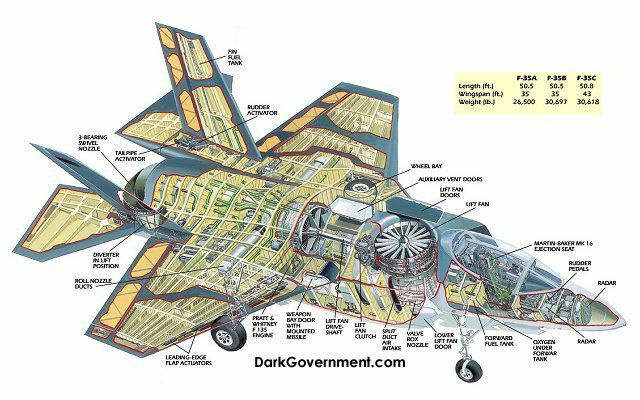 So, if you close down the exit hole on the bottom of the F-35 fan, then that air takes another path – right out those 2nd set of doors. 9 out of 10 diagrams on the internet call that second set of doors an auxiliary inlet. However, that is NOT 100% correct. It should be called an auxiliary exhaust. Now, to be fair, because the cold inlet turbine compressor is also exposed to that vent area, then no doubt that area likely remains "negative" pressure most of the time. However, this is quite a brilliant design, since that lift fan exit area in general has some amount of "close" and thus "some" amounts of fan exit air is going to be vented (by-passed) right into that "box" behind the lift fan. So likely that area remains negative due to the compressor inlets. However, that area will go positive with most of the lift fan exhaust closed. In this case, then those two doors are in fact a lift fan exhaust vent – not an intake vent! I should also point out that due to vast amounts of cold air hitting the deck with this lift fan system, Lockheed engineers state that the overall deck temperatures are less than a Harrier when landing on the deck of a ship. So while both Harrier and F-35 tend to heat up the decks on a vertical ship landing, the F-35 actually is less of a heating problem then is the Harrier for such vertical landings. With this system, nozzle thrust may be directed in an arc of 41.75-104 degrees (fore/aft aircraft coordinate system), at a rate of 40 degrees per second. Ok, so far, above ONLY talks about directing the down thrust. VAVBN = bottom exit part (also variable). 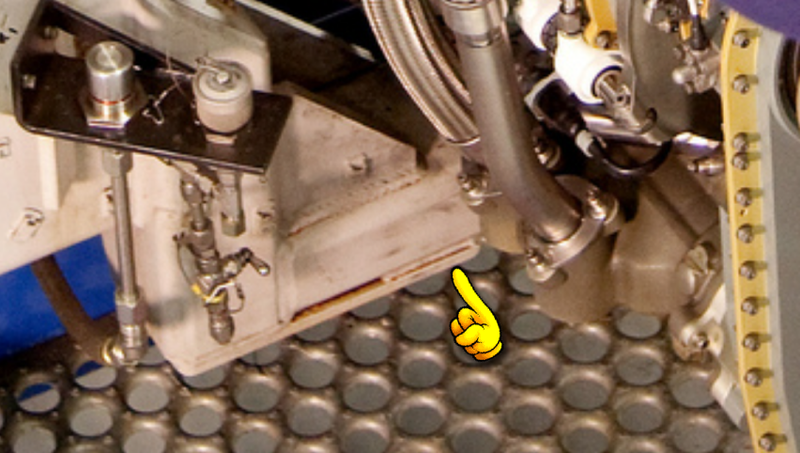 So above states the VAVBN actuators (the EXIT PART OF THE FAN) can vary the nozzle throat area. My claims: Lift fan blades are NOT variable pitch. There no evidence, no diagram, or ANY information of ANY kind in existence that CHANGES this claim of mine. I stand by this claim. Lift exit fan can open/close or "vary" the fan output. Again, the above document 100% supports and verifies my claim. NOT verified: My claim that when closing down the 20,000 lbs of fan vent flow, that flow HAS to go some other place, and I am claiming that flow goes to the air box behind. This is a SPECULATION on my part. I do believe this to be what occurs but I do NOT have a link or article that outright states this (some diagrams DO suggest this, but that would not be proof). So this claim of mine that fan air vents to the air box behind is NOT verified by me, and until I can provide solid evidence of this, then that claim should be taken with a grain of salt. As for the speculation of air venting out of the fan box, this here is a photo. It is "difficult" to tell if that is a vent door, but does seem to look like one. As noted - I am open to opinions on this - this right now thus is still a speculation on my part. 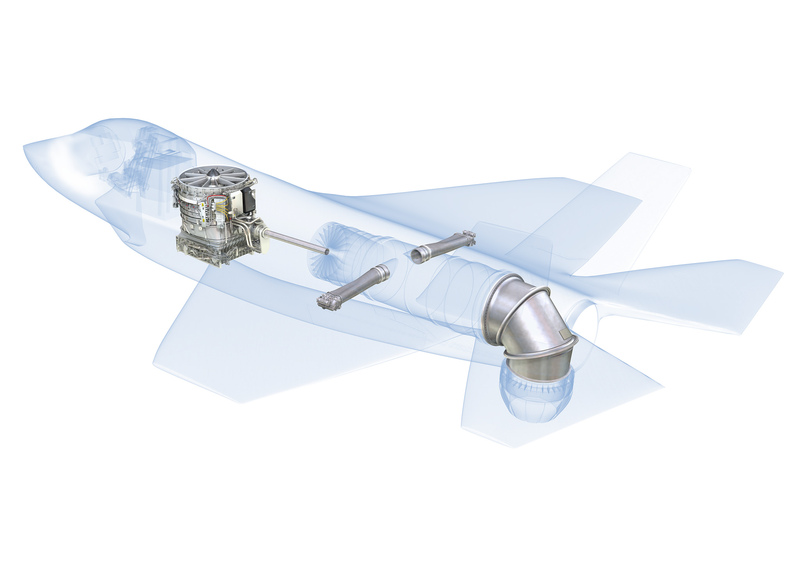 "For pitch control, the areas of exhaust nozzle and LiftFan inlet are varied conversely to change the balance between them while maintaining their sum, and with constant turbine speed"
So yes, the thrust is modulated to accomplish this. 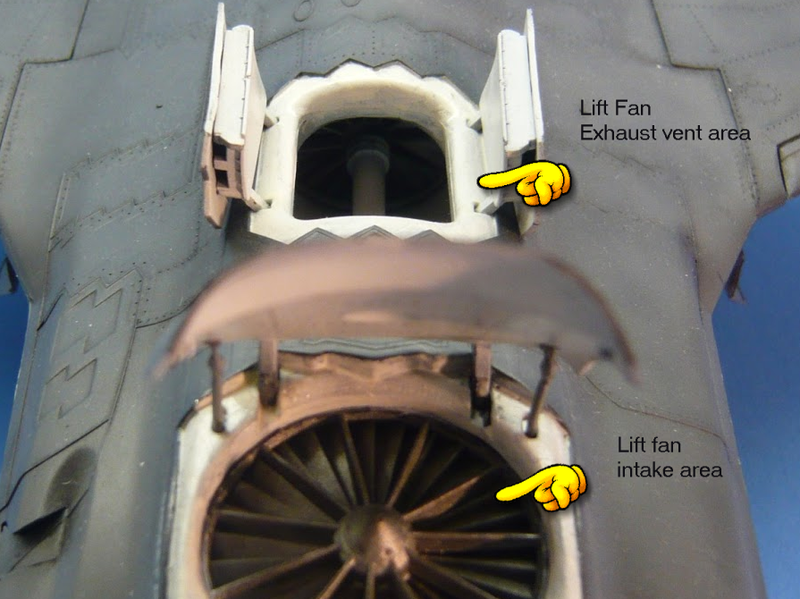 From what is available on the internet, the F35B's lift fan is more than just a simple shrouded fan. There is at least some variable guide vanes functioning as nozzle. So to answer your question, no, the lift from front and back seem to be completely (lift fan by variable guide vanes, engine nozzle by, well, a variable nozzle) adjustable. Not the answer you're looking for? Browse other questions tagged aircraft-design takeoff aircraft-physics vtol f-35 or ask your own question. Is excess lift or excess power needed for a climb? In a non-symmetric turn, how do the side slip angle and thrust side slip angle affect the equations of motion? 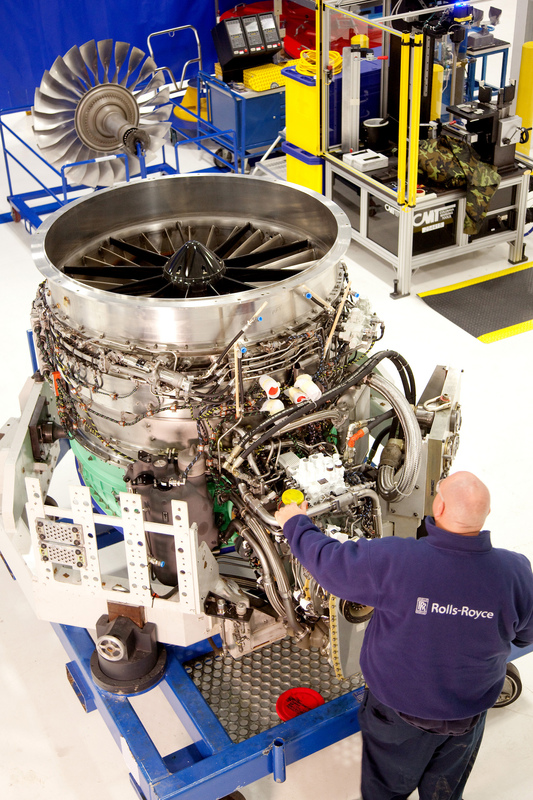 Can the lift fans used on a F-35 be driven by a turboshaft engine instead of the jet engine? If yes, which one? Does lift equal weight in a climb? How is vertical speed managed in Airliners? What are the effective span and lifting properties of a circular wing? Load factor and how does velocity affect it? How does Mass affect rate of turn?